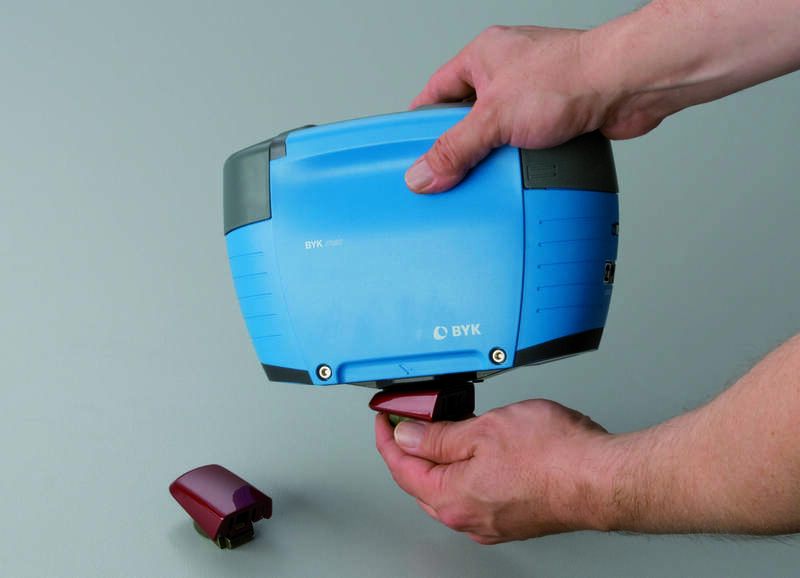 BYK-Gardner BYK-mac i with small aperture can measure effect finishes on small or curved parts. Photo courtesy of BYK-Gardner. Sample size and shape are important considerations when selecting a color or appearance instrument. Instruments typically have a fixed aperture size, and samples must cover the entire aperture in order to be measured accurately. This is typically not a problem when measuring raw materials. Paints and coatings can be drawn down on a byko-chart for a large, consistent measuring area. Cuvettes can be filled to any amount. Test panels can be painted to simulate how a coating would look on the final product. The difficulty usually comes when trying to measure a product in its completed form. Maybe the product has curvature; this can be difficult to measure with gloss meters and spectrophotometers with direct illumination (45/0 or multi-angle). Maybe the product is oddly shaped making it difficult to properly position the instrument for measurement; or maybe the part is simply too small to be measured in its final form. Sample Holder for small parts that can be used with the BYK-Gardner color-guide or the BYK-Gardner spectro-guide. Photo Courtesy of BYK-Gardner. What can be done in these cases? Color instruments come with a standard aperture size, but some also have a “small aperture” version available. The BYK-Gardner spectro-guide comes with a standard 11mm aperture; however there is a 4mm aperture color instrument available for those looking to measure parts too small for the spectro-guide. The BYK-mac, a multi-angle instrument, comes with a standard 23mm aperture, but is also available with a 12mm aperture for measuring smaller parts. A smaller aperture also mitigates the effect of curvature, as a smaller portion of a curved surface better approximates a flat surface. BYK-Gardner micro-wave-scan can measure Orange Peel and DOI on small and curved surfaces. Photo Courtesy of BYK-Gardner. For gloss meters, the challenge with curved parts is to position the meter exactly tangential to the surface. Directionality is very important when it comes to gloss measurement. The meter detects light that is reflected off of the surface at exactly the opposite angle to the illuminant. If the positioning of the meter is off by even a degree or two, it will result in a lower gloss reading than you would otherwise get. A good way around this is to take a large number of measurements. This is especially easy with the BYK-Gardner micro-gloss meter which is equipped with continuous mode; when turned on measurements will automatically be taken at a selected interval as small as one second. With this feature turned on, the meter can be slowly rotated across a curved surface, taking a large number of measurements and ensuring correct positioning for at least a portion of those readings. When continuous mode is stopped the meter will display the maximum measured gloss value, which can be taken as the “true” gloss value. When attempting to measure small, curved, or oddly shaped parts, the best place to start is to talk with a BYK-Gardner representative. We can help you determine the best method for taking accurate, repeatable measurements. The best way to do this is often to send us samples of your product if available, that way we can determine firsthand what the best practices are for achieving the results you want to see. To discuss measurement practices call our tech support department at 800-343-7721 option 3, or contact your local BYK-Gardner representative by clicking here. Choose the country in the upper right pull down menu.